This week on Christian world news. This pastor has led more than 1500 Muslims to Christ in Sweden. Here how her story of a skate is leading others the spiritual freedom. but in the U.S., hundreds of thousands of government workers are working without pay, as they struggle to meet their needs the church is stepping into help. 이번 주 크리스찬 월드 뉴스입니다. 이 목사님은 1500 명 이상의 이슬람 교도들을 스웨덴의 기독교로 인도했습니다. 그녀의 스케이트 이야기가 어떻게 다른 사람들에게 정신적 자유를 이끌었는지 알아보겠습니다. 미국에서 수십만 명의 공무원들이 무급으로 일하고 있는데, 교회가 도움을 청하는 그들을 위해 애쓰고 있습니다. And a global Christian organization is sending young believers to Palestinian territories who then go back to their churches and spread anti-Israel propaganda. 세계적인 기독교 단체가 젊은 신자들을 팔레스타인으로 보내고, 그 후 그들이 교회로 돌아가 반이스라엘 선전을 퍼뜨리고 있습니다. Welcome to this week's edition of Christian world news. I'm George Thomas. and I'm Wendy Griffith. 이번주 크리스찬 월드 뉴스입니다. 조지 토마스와 웬디 그리프스입니다. Well Kurdistan is often referred to as the other Iraq is located in the north Kurdistan is an autonomous area controlled by Kurds since 2014. 쿠르디스탄은 2014년 이후 쿠르드족이 관할하는 자치지역으로 이라크 북부지역으로 자주 거론됩니다. Kurdish soldiers have fought alongside US and coalition forces to drive the Jihadi ISIS army from thousands of miles of territory in Syria and Iraq. 쿠르드족 군인들은 시리아와 이라크의 수천 마일의 지역에서 지하디 이시스를 몰아내기 위해 미국과 연합군과 함께 싸웠습니다. Now with the U.S. plan to exit from neighboring Syria, many Kurds are once again worried about their long-term future. CBN contributor Chuck Holton joins us from the Kurdish capital of Erbil Chuck. You had a chance to visit a small Church in Erbil that's led by American missionaries. 지금은 미국이 이웃 나라인 시리아에서 철수한다는 계획으로 많은 쿠르드인들이 그들의 장기 미래 계획에 대해 다시 걱정을 합니다. CBN 기고가 척 홀튼이 쿠르드족의 수도인 에르빌 척에서 우리와 합류했습니다. Yeah fascinating church service this morning George. It's run by a couple who moved here about nine years ago. He's a former Marine and went to seminary and became a pastor and felt led to come here and start a church. and I would say that there were at least 20 or 25 different countries represented there as they catered to expats that are in this community and there are lots of expats here in Erbil. 오늘 아침 예배는 멋졌습니다, 조지씨. 약 9년 전에 이 곳으로 온 부부에 의해 운영되어지고 있습니다. 그는 전직 해병이었고 신학교에 갔고 목사가 되었으며 이곳에서 교회를 시작하도록 부름을 받았습니다. 이 교회는 아마 오늘 아침 50-60명의 사람들이 예배에 참석했을 겁니다. 이 커뮤니티에 있는 외국인들이 찾고 에르빌에는 많은 외국인들이 있기 때문에 적어도 20 개나 25개의 다른 나라 국적의 사람들이 있다고 말할 수 있을 것입니다. As you well know, the most interesting thing however was the Iraqi member in this church. that he converted from Islam to he became an atheist and then eventually to Christianity was because of ISIS. 알다시피 이 교회에서 가장 흥미로운 것은 이라크 신자인데 내가 얘기했던 쿠르드족이나 이라크인, 또는 심지어 전에 무슬림이었던 이란인들도 있습니다. 그들 중 한 사람과 이야기를 할 떄 그가 나에게 말한 것은 그가 무슬림에서 전환해서 무교자가 되었다가 결국 기독교인인 된 것은 ISIS 때문이라고 했습니다. He said that after seeing the brutality that was you know demonstrated by ISIS since 2014 in this area. 그는 2014년부터 ISIS가 이 지역에서 보여준 잔혹성을 보고 나서라고 말했습니다. 그들 스스로 자신을 무슬림이라고 부르는 사람들에게 더이상 참을 수 가 없었습니다. 그리고 그는 같은 식으로 느끼는 많은 무슬림이 있고 더 좋은 믿은 더 많은 사랑하는 믿음을 찾는 많은 무슬림이 있다고 말합니다. And you're saying that more Muslims are open to hearing about Jesus because of what they saw their fellow called religionists do in the name of Islam against them? 당신은 그들에 맞서서 이슬람이라는 이름으로 소위 종교인들이라고 명칭하는 사람들이 하는 것을 보기 때문에 더 많은 무슬림들이 예수님의 말씀을 배우는 것에 개방되어 있다고 말씀하시는 건가요? That's exactly right and as a matter of fact there were quite a few young men at the church this morning who were not Christians yet but they were they're just seeking. They were listening, they were reading the Bible and and trying to get their questions answered Some of them have seen visions and others are like I say. The pastor said many of them are just so disgusted he said that they're that's a general consensus here in Kurdistan. 맞습니다. 사실 오늘 아침 아직 기독교인은 아니나 여전히 찾고 있는 꽤 많은 젊은사람들이 있 교회에 있었습니다. 그들은 성경 말씀을 듣고 읽고 답변되어진 질문에 집중하고 있었습니다. 그들 중 몇몇은 비전을 보았고 다른 사람들은 제가 말한 것과 같습니다. that the pendulum is kind of swinging the other way and it seems like this culture is even throwing off those cultural norms even more than the religious ones. 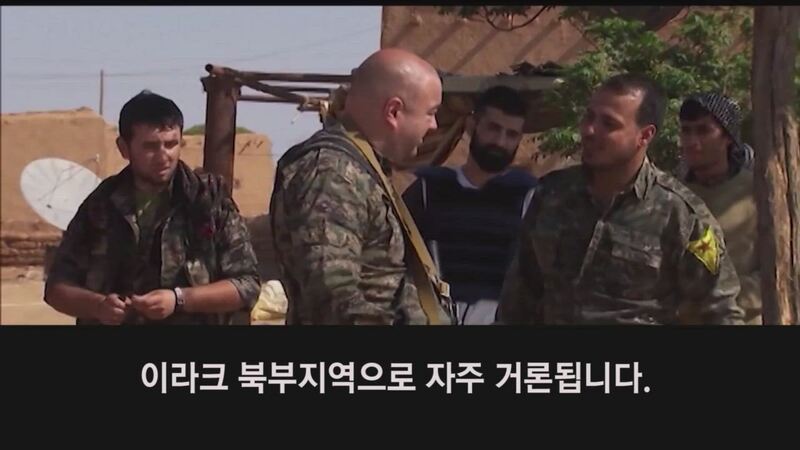 그래서 많은 사람들은 ISIS에 의해서 행해진 믿을 수 없는 잔혹성에 넌더리를 느끼고 그들의 중심이 흔들리고 있습니다. 이 문화는 문화규범들을 버리고 있으며 더 많은 종교적 규범들을 버리고 있습니다. and I was really surprised at just how Western the dress is with from the women here. 그래서 북부 이라크 지역에서 조금 전 쇼핑몰에서 막 나온 여자들 중 히잡을 쓰고 있는 여자들이 점점 더 줄어들고 있음을 볼 수 있습니다. 나는 이곳의 많은 여성들이 서양 옷을 입고 있는 것을 보고 정말 놀랐습니다. It's always been that way to some extent as you know in Kurdistan because it's a very cosmopolitan area that is very accepting of other face although their majority Sunni. They have Yazidi, they have Druze and, they have a Syrian Christians and all different sorts of believers here but it's just surprising to me how western the culture is beginning to become. 수니파가 대다수임에도 불구하고 다양함을 받아들이는 대도시이기 때문에 쿠르디스탄에서는 항상 이렇습니다. 야지디, 드루즈, 그리고 시리아의 기독교인들과 모든 다른 종류의 신자들이 있습니다. 그러나 서양 문화가 시작되고 정착되고 있는 것이 놀라울 뿐입니다. homeland. Is that still a reality for them? 척, 시간이 정말 빠르네요. 쿠르드족은 오랫동안 그들 자신의 나라를 원했습니다. 그것은 여전히 그들에게 현실로 이뤄질 수 있나요? I mean there's probably not a reality anytime soon because Iran is very deeply in control of Iraq and they don't want that to happen. The Syrians certainly don't want that to happen, the Turks don't want it to happen. I think if the United States were to get behind them having their own homeland, they might have a chance. but as they say here the Americans will always do the right thing once they've expended all other options. 내 말은, 이란이 이라크를 매우 깊이 통제하고 있고 그런 일이 현실이 되는 것을 원하지 않기 때문에 아마 당분간은 현실성이 없을 것이라는 겁니다. 시리아 인들은 확실히 그런 일이 일어나길 원하지 않습니다. 터키인들도 원하지 않습니다. 만약 미국이 그들이 자신의 조국을 갖는 것을 지원한다면 기회를 가질 수 있을지 모른다고 생각합니다. 하지만 그들이 말하는 것처럼 일단 그들이 모든 다른 조건들을 써버리면 미국인들은 옳은 일을 할 것입니다. Thank you we need to leave it right there Chuck Holton coming to us from Erbil. stay safe my friend, all right. 감사합니다 조지 에르빌에서 오도록 해야 합니다. 조심하시길 바랍니다. We'll see you win all right. 우리는 승리하는 당신을 볼 것입니다.